Jeg havde dette julekort med i sidste års jule-særudgave af Ett Trykk. Udfordringen var at lave julekort i bestemte farver, og dette kort er altså rødt. Jeg stemplede baggrunden med ordet Christmas fra Winnie & Walters The Big, The Bold and Merry. Derefter samlede jeg en sandwich af glimmerkarton, hvidt karton og det stemplede karton, og syede dem sammen, inden jeg monterede dem på forsiden af et rødt kort. Kortets dekoration er også kortets hilsen, og det består af et udstanset “Merry” (også fra Winnie & Walter), et banner udstanset i vellum og stemplet med “Christmas” (fra Lawn Fawns Joy to the Woods) samt lidt pailetter. Ordet merry udstansede jeg flere gange i hvidt karton og en enkelt gang i guld glimmerkarton. Jeg limede dem alle ovenpå hinanden for at give ordet lidt mere dimension. This card was made for Online Card Classes’ Stretch Your Dies class earlier this year. 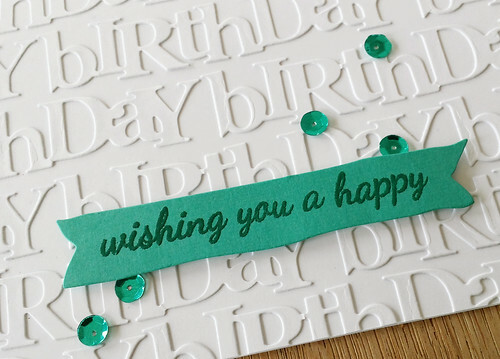 I diecut multiple “birthdays” using Papertrey Ink’s Wonderful Words: Birthday Die in the same white as my card base. I then adhered all of the birthdays directly onto the card base. 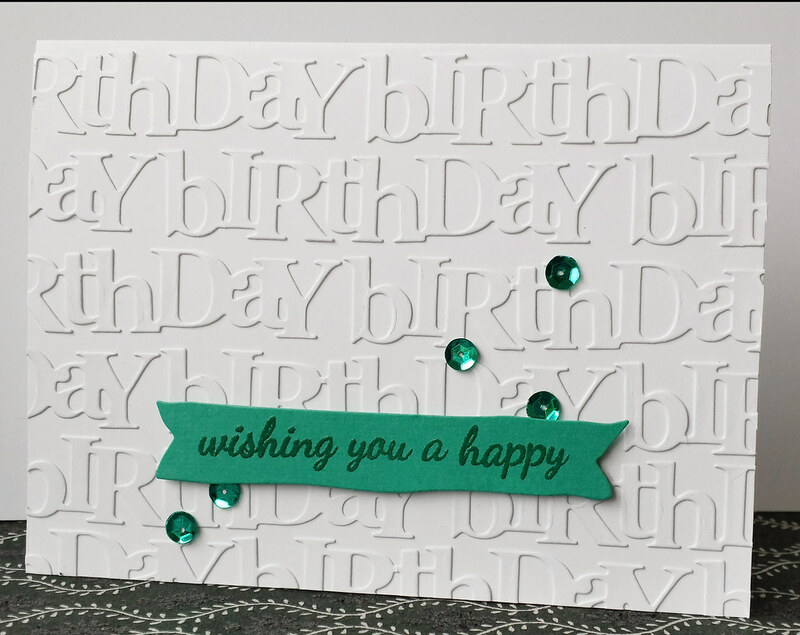 Because the background got to be somewhat busy I decided to keep the decorations to a minmum: A diecut banner with an embossed sentiment and a few sequins in a matching colour and that was it. KIIS! 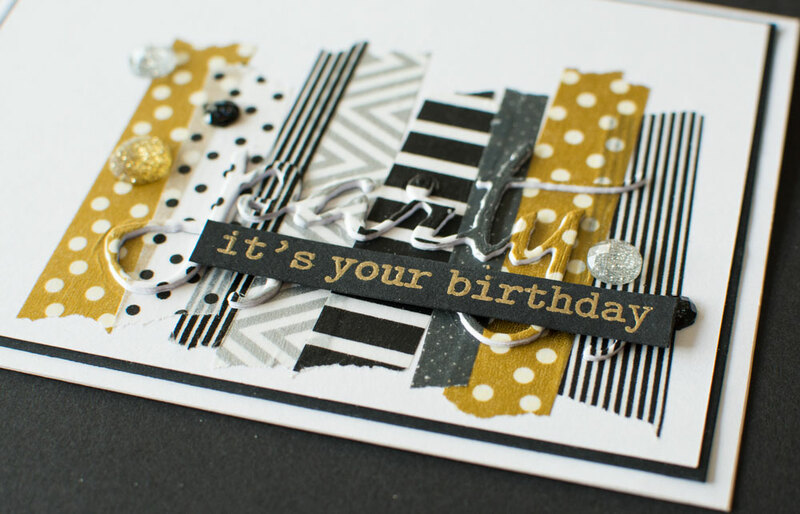 I had this card picked up by Ett Trykk for their washi theme in the August edition of the magazine, so I haven’t been able to show it until now. 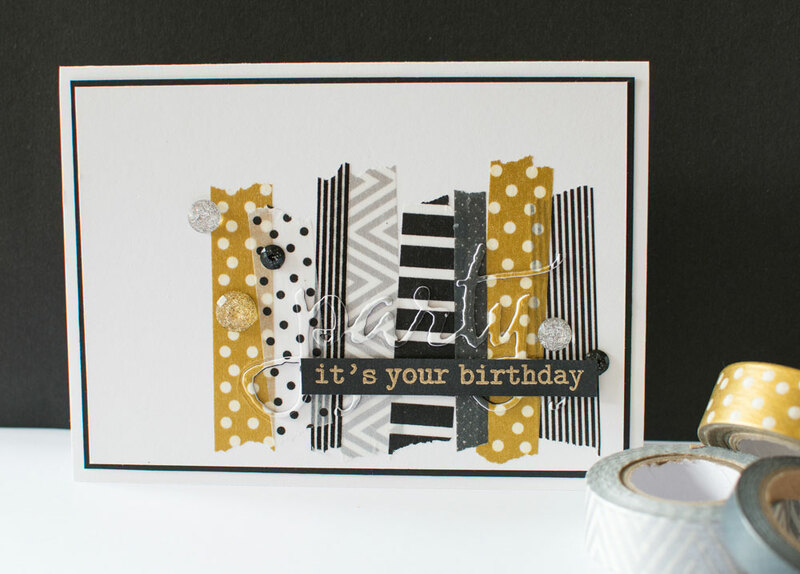 For this card I went with various washi tapes in black, white and gold. I added them to a white piece of cardstock in a somewhat random “pattern” overlapping the washi tapes and giving most of them a slight turn to one side or the other. Before I went further with my design, I made sure that the die I wanted to use would fit within my washi taped area. Once I was sure it would I die cut straight through the washi tape and the cardstock. Then I die cut four more word using the same die and sandwiched them under the one covered in washi tape before fitting it back into the area the original die cut had left. This meant that my word popped up against the background and thus became visible against the surrounding pattern. 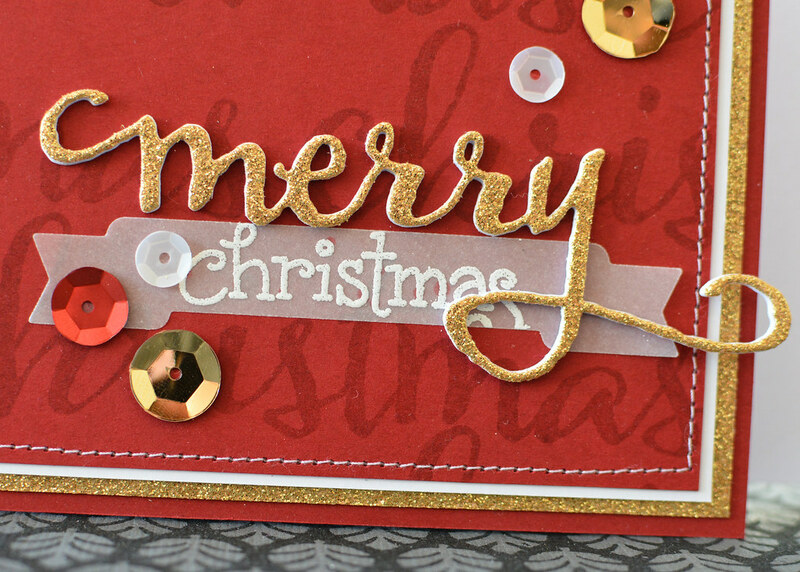 To finish the card I heat embossed a sentiment in gold on a tiny sliver of black cardstock, added it above the die cut word and then scattered some bling around my sentiment. Back in January, I got an order for a card for a baptism. This card had to feature a picture of the little girl getting baptized and her grandmother wanted the card to be A5 which is app. double the size I normally use for cards. 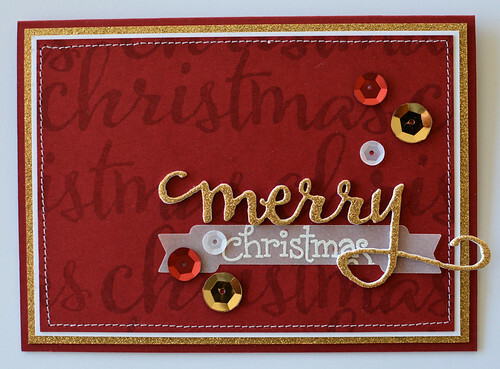 Actually, it wasn’t too hard making a card this size since it is much like making a letter size layout. 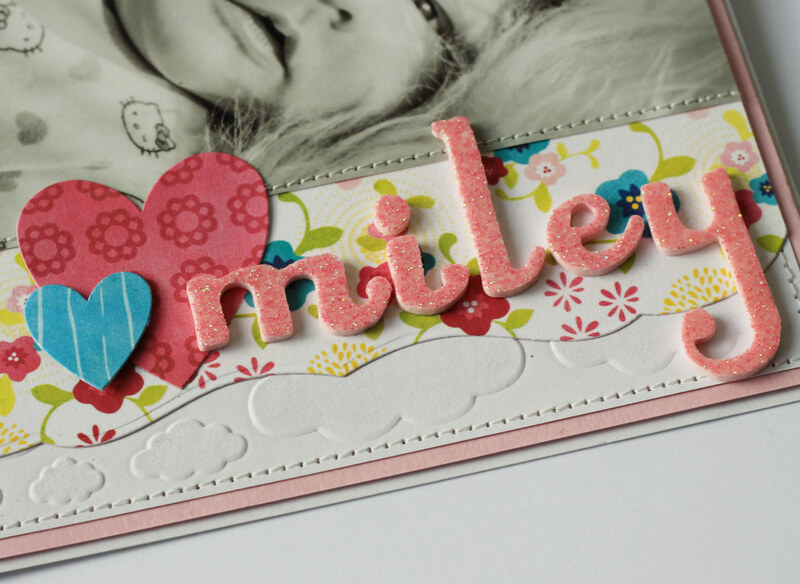 I went with a dreamy, girly theme using a large embossing folder to add clouds (and dimension) to the white part of the background. I was able to diecut a decorative border on the patterned paper using a Papertrey Ink die. Then I added the girl’s name in thickers and a couple of hearts under the picture. 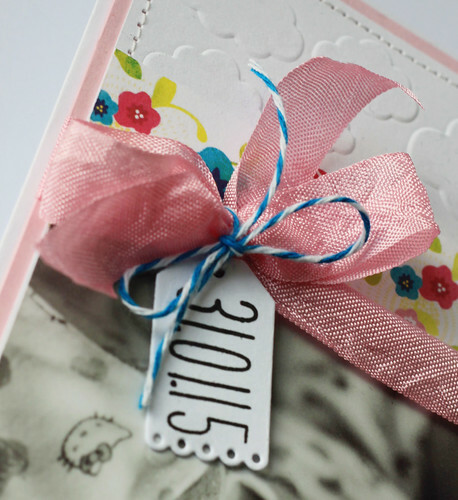 I had tied seam binding all the way around the card and I knew the bow was the perfect place to add a little tag with the date of the baptism.